Wilderness State Park is a popular Carp Lake area campground located only 10.6 miles from the facilities of Mackinaw Mill Creek Camping in Mackinaw City, MI. Situated on over 26 miles of beautiful Lake Michigan shoreline, Wilderness State Park offers year-round recreational activities and 259 campsites on 10,512 acres. Camping styles vary widely and many State Parks may not be a good fit for some campers. Wilderness State Park varies in their accommodations, features and facilities compared to Mackinaw Mill Creek Camping, so we have gathered information on Wilderness State Park and contrasted them with Mackinaw Mill Creek Camping. 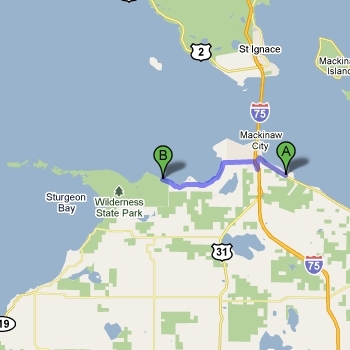 The chart below compares Wilderness State Park versus Mackinaw Mill Creek Camping. Dozens of site types Wilderness State Park offers 259 campsites, some with electrical service. 200 Full Hookup Sites Limited to 20 amp and 30 amp sites. Variety of Lakefront Cabin Rentals Some rustic cabins available. The experience I had at your campground was excellent! The team at your campground is doing an outstanding job and I wanted to compliment all of you on how well kept your sites are. My friends and I camped the weekend of August 7, 2014. We saw pictures on the campground's website and we were excited to spend the weekend together. The cabin description said we would have a view of the Mackinac Bridge and could see Mackinac Island from our cabin porch. When we arrived the first thing we saw from the porch was just that. Before unpacking, we all walked in the cabin to see what we were going to be staying in for the weekend. The cabin was so clean. We were just amazed at how fresh and new the furniture and beds looked. The floors were free from any dirt and the place overall was spectacular. It was so pleasant having a beach right down the road that was never too crowded. Having the camp store in the middle of the campground was also very convenient. We were first time campers, so we did forget some necessities, but with the camp store down the road from our cabin it made it easy for us to pick up the things we forgot to bring from home. The entire weekend my friends and I repetitively said to one another, we picked the perfect place to stay this weekend, and we could not have chosen a better campground. The amount of fun and laughter my friends and I shared that weekend was one to remember. Camping at Mackinaw Mill Creek was one of my most fond memories from this past summer. I cannot wait to come back next summer and spend more time there. Thank you so much for taking care of us and keep up the good work. We will see you next summer!